Now that there’s a mooring, and a place to live by the water, the next question has been how to get back and forth in a reasonably stable way, good for those who are not necessarily water rats, like some of us. Quite a bit of pondering has gone on, and then recently the sale of the old place in Holyoke went through. 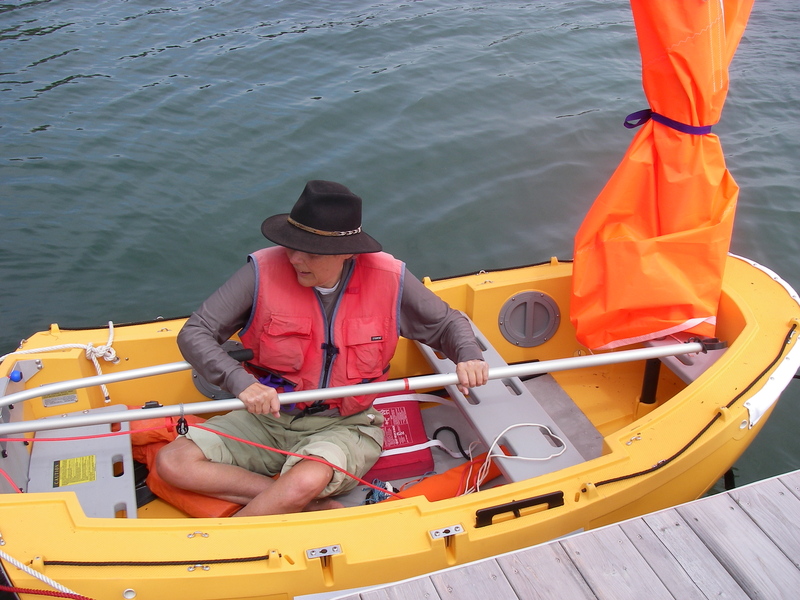 That did it – now we have the new tiny rowing/sailboat. The Portland Pudgy came along as an idea a number of years ago, when I first read about it in one of the boat magazines, though at that time you still couldn’t get one. It’s been on my mind ever since, and then last year in Belfast a couple of folks were rowing by in one and stopped to talk, on the way back out to their sailboat. The Pudgy looked even better in person than it had in all the literature and articles, and the occupants were very happy with it. This boat is specially designed as a rowing and sailing dinghy at the same time as being able to be converted into a lifeboat, out at sea. A tremendous amount of thoughtful detail has gone into all of its various aspects – it is sturdy, and surprisingly stable; it rows well, is self bailing when unloaded, and it has a sailing rig. Made of roto-molded polyethylene, the same stuff used for plastic kayaks, it’s tough enough to be bumped around and not care. Self-bailing counts for a lot – left at the float in the rain, the boat will not be half sunk when you come back three days later. Bailing after every rain is a task I have been particularly opposed to adding to our boat fun. If you were to tow it, there would also be no worries about filling with water in the waves. It’s not actually in my plan to tow this dinghy in back of AUKLET. The inflatable packraft is good enough, and stows easily, deflated and rolled up. I find it much too nerve-wracking to have a dinghy in back of the sailboat when the weather gets interesting, and AUKLET is much too small to carry one on board. But this new little boat is going to be great for going back and forth between the mooring and the shore. Even better, it’s perfectly lovely to sail by itself, for the pure fun of tooling around the Bay, when most other sensible boats are still snug in a boat shed, or under a tarp. The Pudgy can come out to play for the odd warm day, with very little fuss at all, and is secure enough to make one feel that the idea is not utterly ludicrous from a safety perspective. This boat is also double hulled, with flotation between the sole and the outer hull. When I read about this, thoughts of the insulating value of that arrangement came to mind, as I contemplated sailing on a warm day on otherwise very cold winter water – and it’s true! When we launched the boat this morning, actually taking it sailing wasn’t first in mind. But it became so easy that shortly after the boat was floating, the sailing rig was on, and off we went. More of a jacket would have been nice, but the warm spot was down in the boat, even though the water temperature is something like 40° F at the moment. You can see the gray closed cell foam that we also put in, to keep from getting wet with water in the channels – I’m sure that helped too, but regardless of where I touched the plastic, there was never that “bare feet touching freezing cold surface” feeling that is so familiar from other boats on cold water. I’m a happy camper. The sailing rig that comes with the boat is nice in many ways, including that it can be stowed in a compartment within the hull, accessible through the transom. The only tricky thing is that the sail is held up by a sleeve that goes over the top of the mast and gaff. Having no halyard, the sail cannot be lowered in a pinch. 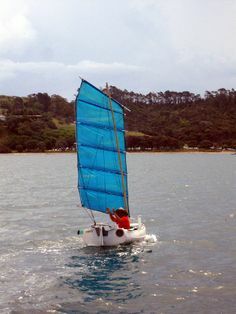 Reefing is done by either raising the bottom of the sail or shortening the mast with a telescoping adjustment, and gathering the lower part of the sail. The rig moves the boat quite nicely, and I might very well get the hang of furling the sail up against the mast without standing (which is a pretty unstable thing to do, right up there in the bow), but it’s not simple. So that’s the latest. AUKLET and SERENITY (the Peep Hen) are snug in the boat shed, with thoughts percolating for sometime soon. In the meantime, hooray for sailing! Many thanks to Suzanne Jean for all of the photos in this post, except for the one of PUGWASH, which I have taken the liberty of lifting from the Internet. Down East – I’m so sorry I’m missing you in Old Saybrook! Timing is one year out of sync – rats! Come to Maine next?? Congratulations Shemaya. This seems a wonderful addition. So glad you can go out to play on warm spring days. I have wondered about those. Sounds great! Is it heavier than the average rigid dinghy of the same size? It is… I think that’s a plus, for stability, but it was a job to get it off the top of Joanne’s car. Thank goodness she brought her 18-year-old son to help. I have my eye on a spot to put a hefty ring on the boat shed for a lifting tackle, for jobs like that in the future. Once on the ground it’s not so bad – they say that two people who are seriously strong can carry it. The little wheel at the back of the skeg makes it possible for one person to move it around, but it’s not so easy. PVC pipe rollers were nice for getting the long way from the driveway to the shore, when it was just me and Suzanne. 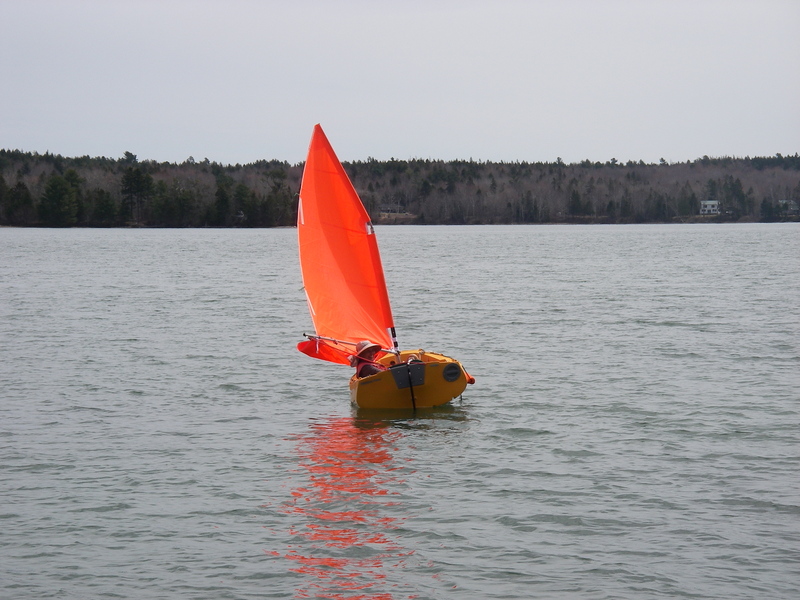 I’ll bet that your little dinghy is a heck of a lot easier to move around! The Pudgy is practical, safe and cute. Looks like you’ll have lots of fun there. And hooray for plenty of different electronic avenues! The Portland Pudgy is a proper prodigy of convenient safety! I was amazed to see how high she floats with that family of 4 aboard, and how much gear stows within the hull. I do question the safety of a sail that can’t be doused quickly, though your junk rig would resolve that issue. And, of course I love her orange sail! I believe in highly-visible tiny boats. Thanks so much for sharing her baby pictures with us. About the size of a PD Racer! I so agree about the visibility – it was great to see in that faraway picture how much it stands out. On the bright side, as far as the rig, at least one can let it go free in a pinch, if with a lot of noise. I have a couple of details to ask the builders about, and it’ll be a good opportunity to see what they suggest on this – a junk rig will completely solve that issue, but I do wonder about when the boat is in use as a lifeboat, out to sea, what they think about sail management. They’ve thought everything else through so thoroughly, there’s probably something I’m missing. I’ll keep everybody posted! I look forward to learning what they tell you! Puddle Ducks are not seagoing vessels, so they don’t need to be so well built. They are super toys for getting out there and having fun close to shore. Just build another for incorporating new ideas. I want to build a flat-topped one because the cuddy interferes with leaning back for a good long pull stroke when rowing. Also it will be easier to have more than 1 other person aboard. She’ll hold about 700 pounds, so 4 could fit in easily without cramming them under the cuddy; one per corner, so to speak. Or two on forward thwart and two sitting on deck at aft corners… one for aa day sailer and the other a cruising vessel. That sounds great, a couple of PD Racers, for different uses! Since fooling around with the Pudgy, I started thinking about how one could build a PD Racer with a double hull. A cockpit sole about 3 inches above the bottom of the boat, filled with flotation, and the PD Racer configuration that has long flotation boxes on either side. It would take some experimentation to find how high the sole would need to be to make the boat self bailing, which would be the biggest goal, along with the insulation aspect of the double hull. Have you seen about the folks who sail the Texas 200 in PD Racers? It’s amazing to me that they do that, but the physical stamina required is completely out of my league, especially in the heat. I sure do have a lot of fun thinking about it though, and watching what they do each year! Yes I have heard of the Texas 200 – and what a grueling trip that must be! I gather it is always rolling waves because it is relatively shallow water all along that coast. If I were forty or fifty years younger, I’d very much want to try it – to finish, even if I were a delayed last. I am happy just looking at photos and reading of their adventures – and misadventures. I also read of a couple who went down the Rhine from Switzerland to the sea. Lovely photos, though not many. Someone was thinking of, or maybe actually building a styrofoam cored Duck. As I recall, they used door skins, that 1/16th inch plywood used for making the standard flat door with the cardboard honeycomb inside. I gather the stuff comes in longer than 8 ft pieces. He glued that to the 2″ styrofoam for both bottom and sides, although I do not know how he managed to curve the bottom. I suppose one could have two layers for a 4″ bottom extending up into the cockpit. That would also allow you to have higher sides so you could sit on the side without having your knees bumping your jaw so you bit your tongue. If one made V notches of the proper angle and spacing, I suppose then it would bend to the point that the notches closed (with glue inside, perhaps?) and then the door skins would be glued on either side. I suppose the styrofoam is glued directly to the pieces forming the sides and then quarter rond helps join or lap tightly the inside joints between cockpit bottom and inner side pieces. Maybe some special tape on the outside joint all around the bottom. It is only the bottom 10″ of the hull sides which have specified dimensions. A hull could be only 10″ deep, or could be 24″ Look at the picture of me rowing Molly Kool – I think it is on the PDR site – with only 2 adults aboard she still has both ends of her bottom out of the water, as I recall. I find her leaf-like to row; she skims along with scarcely any resistance. I’m not sure how she’d be in a strong cross wind. I’d probably lower the leeboard. The heat transfer is much less in a wooden craft than in a plastic or aluminum one. Even in summer my bare feet on the bottom of an aluminum canoe become num(b). I hear the Germans make all sort of tapes, for vinyl-to-vinyl, wood-to-other-plastics, X to metal, Y to metal, Z to wood, and so on. They were developed for much more efficient house building than North Americans can yet wrap their heads around. Maybe Lee Valley or someone should look into importing them. And that is Boatbuilding According to Helen, possibly as variable in its accuracy as Science According to Helen. Cheers to doing it anyhow! Oh, we are poring over those Texas 200 PD Racer stories at the same time! I love the idea of the foam sandwich with door skins – both warm over the water, and talk about flotation. AUKLET is solid plywood, an inch thick on the bottom panel, but sailing in cold water it’s a chilly business to put your feet down. But then, it’s a bit below the surface, where maybe the water is a little colder, and it’s there all the time, so there’s a lot of time for the cold to work its way in. Easily cured with one of those fuzzy absorbent orange cloths for a tiny rug, but I’m not lying on it! Yes, wood against cold for a long time lets more heat go out than styrofoam does, and I know from swimming that staying in the top 6″ of cold water is a lot warmer than treading water upright. 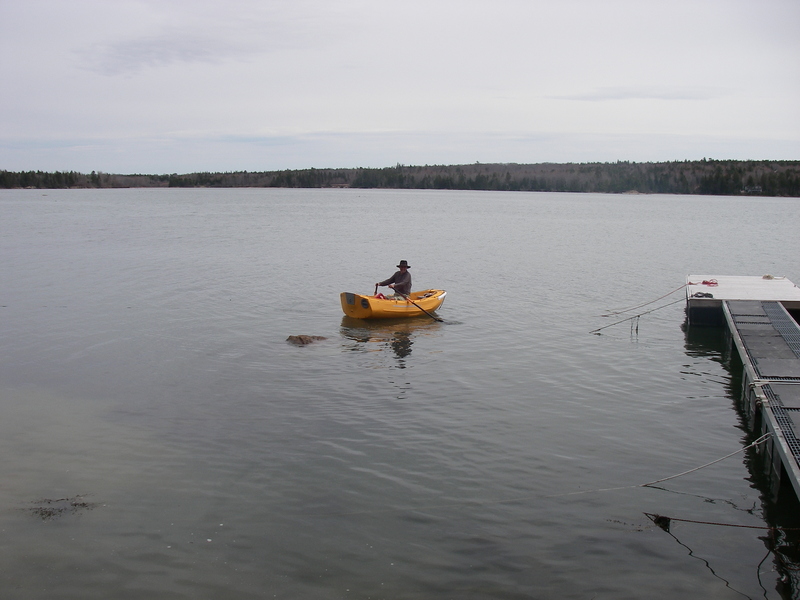 Since I am also a mad gardener, I am happy to stay ashore until I get all my veggies planted, and by then it is warm enough to sail without serious winter clothing. 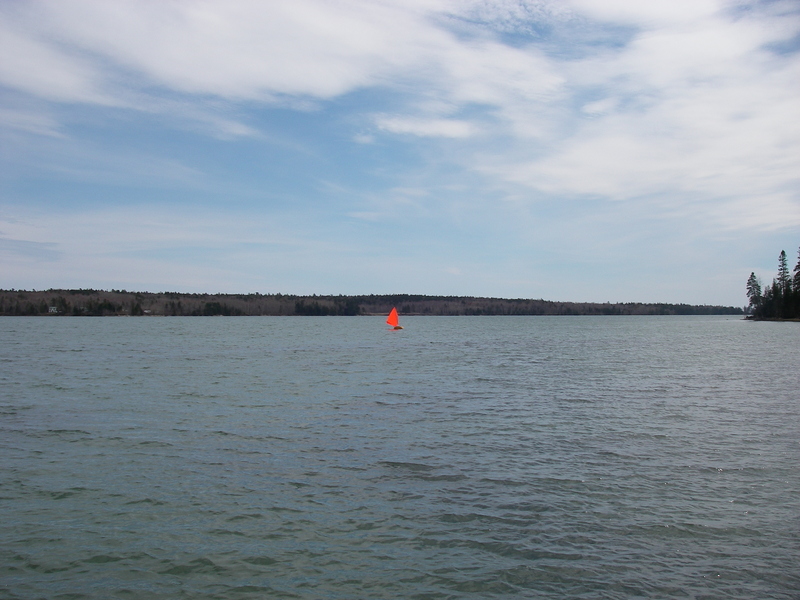 Though I think if my boat were down on the shore at the causeway, I would go out when a large day presented itself. Hauling her on rollers into the water is not as much hassle as hitching trailer to car, making my way down a very rough rock-studded slope to the water and having to wrestle her back up onto the trailer by myself. I am figuring out how to attach my come-along to the back of my car to help haul Molly Kool up onto the trailer. Having a very shot-tongued trailer on a very short wheelbase car (Echo hatchback) and a cheapo trailer with 4 ft tongue with a 4 ft platform makes the trailer wheels very close to the car’s rear wheels. Not good engineering for backing up.